How are your new years resolutions going? I, as always, set the goal to get healthy. I started training to run a 10K in September and then I hurt my back. The healthy eating went out the window. Its been its been 4 months. I’m finally feeling a little better. I’m back to running a little in the morning but I changed the 10K goal. I’m now hoping I’ll be able to make it through a 5K. Anyway…enough whining. I’m setting a mid-year resolution and I’m trying again, so frustrating. One of my favorite healthy meals is salad. 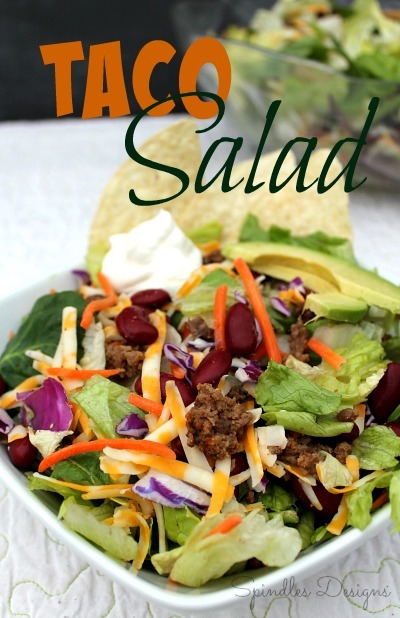 Today I want to share the our Taco Salad Recipe. Place lettuce in a large bowl. Brown beef, drain and season with taco seasoning. Drain and rinse kidney beans. Shred cheese. Now like any salad you can make it as healthy as you want. I really like my salad with salad dressing so I’m willing to add the extra calories. 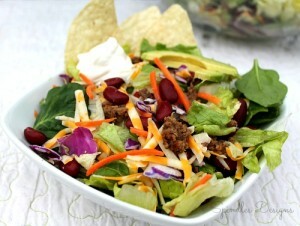 Taco salad is the preferred method for hubs & I on Taco Tuesdays over here! Yum! This looks amazing! Great for summer now that it is so hot. My family will love it! This looks like a perfect summer salad! Not to heavy…yet just enough to be delicious and filling! Can’t wait to try it! Yum! This is a favorite salad in our house, too. Like you, we use the chips instead of the bowls. We’ll have to try adding the kidney beans next time. 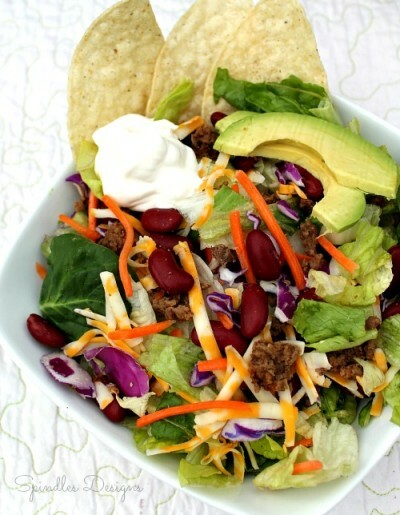 What a healthy and delicious looking taco salad! it’s lunchtime and I could go for this now! This sounds delicious. I love taco salad! You had me at “taco!” I love this recipe–gotta pin it and save for later! Thanks! Salads are so nice and refreshing in the summer. Taco Salad sounds like the perfect summer meal. Salads are so great for hot summer days! What a great summer salad. Thanks for the recipe. Your welcome. I hope you enjoy it as much as we do. Salads are so great for summertime. I’m always looking for a good recipe, thank you for sharing! This is my kind of salad! Looks great! Nothing beats a good ole’ taco salad!